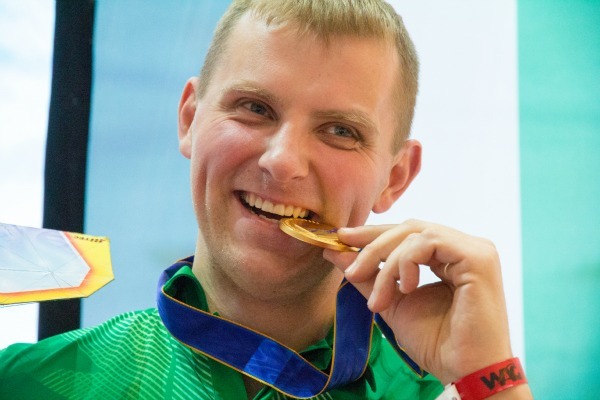 The first gold medal was won in the FAI World Air Games last night (December 1). Lithuania’s Donatas Pauzuolis took first place in the indoor aerobatic aeromodelling, which took place in the Dubai Mall. "I’m very happy to have won," he said afterwards. "It’s a dream come true." Donatas lead the field throughout the competition, and in his final heat, the fourth of four, he knew he had done enough to win. His two-minute routine was beautiful, artistic and entertaining all in the same breath. "That’s a whopping 84 points for artistic quality, and rightly so," boomed the commentator when the scores flashed up on the giant screen above the Dubai Ice Rink. "I’ve been flying models for 20 years, since I was 11," Donatas said, "and competing since 2004." He has dedicated the last six months to training for this event. "I spent the last two months almost exclusively training," he said. "Everything paid off." As well as flying the only hand-built carbon fibre model in the competition – "It took a ridiculous number of hours to make" – he scoped out the size of the venue online before arriving. "I looked it up on the internet and then I looked for a similar sized venue in my country." Fortunately, he found what he needed in a local sports hall. “Thank you to Sportima Hall in Lithuania for letting me use their premises,” he said. Aeromodelling is an exacting discipline in many ways. It’s very technical to make the models for a start, and controlling them takes precision and care. To make the plane "dance" each surface has its own control servo. "You need to put a lot of your mind into it," Donatas added. This is the second World Air Games medal for Donatas, who was also victorious in Turin in 2009. "This is one of the biggest competitions for sure," he said. "Gold first place? I’m happy!"